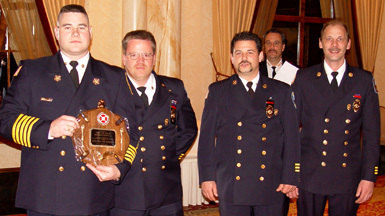 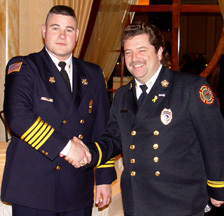 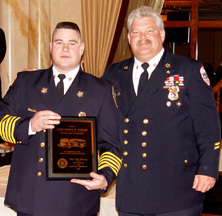 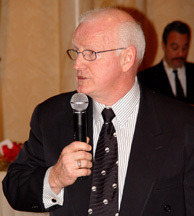 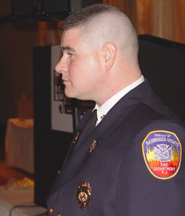 The Hasbrouck Heights Fire Department held their installation dinner for Fire Chief Joseph Taylor Jr. and the Department officers at The Venetian on January 15, 2005. 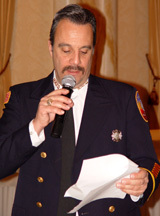 The program began with introductions by Master of Ceremonies former Fire Chief Tony Greco and a benediction by Thomas Rubino. 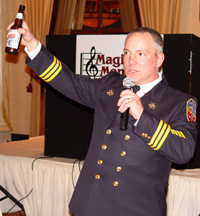 A toast was made by 2nd Assistant Chief Mike Ratkowski with comments by 1st Assistant Chief Angelo Roccamo. 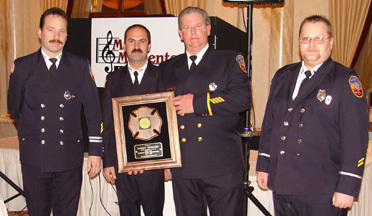 Speakers included Mayor Ronald R. Jones, Fire Commissioner Thomas Meli, and Fire Chief Joseph Taylor Jr.. 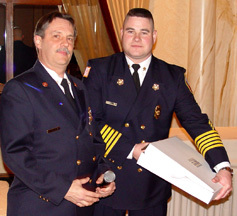 Recognition was given to the immediate past Fire Chief Robert Thomasey, and long time member and former Fire Chief Vincent Monahan. 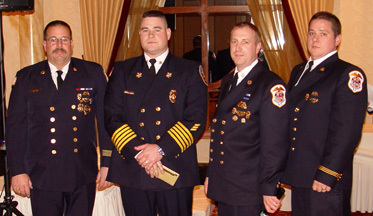 Mutual Aid Fire Departments representing Carlstadt, Garfield, Hackensack, Little Ferry, Lodi, Moonachie, Wallington and Wood-Ridge attended, as well as boro officials and other dignitaries. 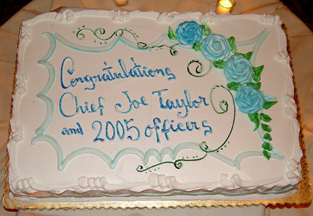 There were Department presentations and floral bouquets were given to the Chiefs' wives. 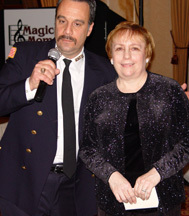 DJ Entertainment was provided by Jason Frankel of Magic Moments. 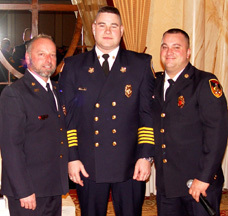 Master of Ceremonies Tony Greco, 1st Assistant Chief Angelo Roccamo and Thomas Rubino. 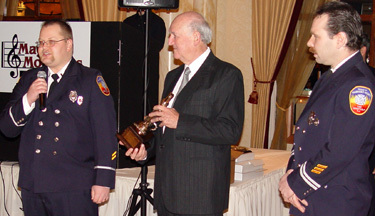 2nd Assistant Chief Mike Ratkowski and Fire Chief Joseph Taylor Jr.
Mayor Ronald R. Jones presenting former Fire Chief Robert Thomasey with a plaque from the Mayor and Council for his service. 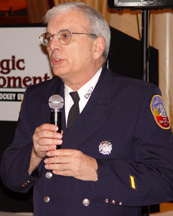 Fire Commissioner Thomas Meli. 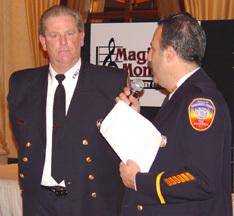 Former Fire Chief Robert Thomasey with Tony Greco. 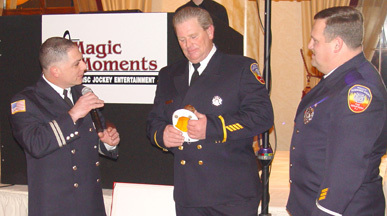 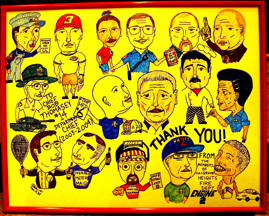 Fire Chief Joseph Taylor Jr. receives mementos and best wishes from area Fire Departments. 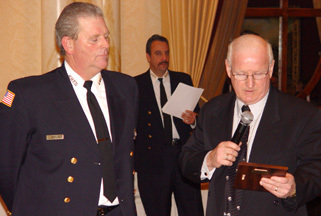 Recognition was given to long time member and former Fire Chief Vincent Monahan. 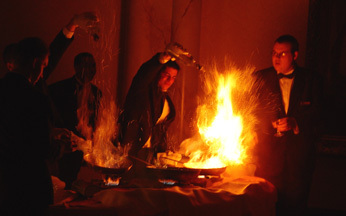 ...and now, let's prepare the"Bananas Foster"